The next big thing? We reckon the Amp 1 will do for pedal amps what the iPad did for tablets - watch out! Fully functional four-channel 100-watt head in an attractive, easily navigable pedal package. Lots of control and useful features. Excellent build. Good value. For the last 20 years or so, Thomas Blug - the brains behind the BluGuitar Amp 1 - has been in the enviable position of carving out not one, but two successful careers. As an amp designer for Hughes & Kettner, Blug has helped produce some of the best-sounding and most feature-packed amps to come out of Germany; as a professional musician, he's won many awards, including the coveted 'Strat King of Europe' prize, and played with many of rock's A list. 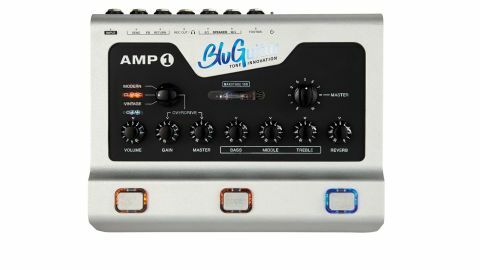 Blug recently started his own manufacturing enterprise called BluGuitar, and its first release is the much-anticipated Amp 1 head. The first thing to note about the Amp 1 is its size. Roughly the same width and length as an iPad and not that much taller, the Amp 1 could easily be mistaken for another multi-effects 'board. "There's also a second operation mode that allows each of the switches to call up a preset using any clean or overdrive voice"
But the Amp 1 isn't necessarily restricted to the floor, it can also sit on top of a speaker cabinet in the traditional way, using a standard latching footswitch for basic control. There's even a cut-out on the underside to allow it to sit over a standard strap handle. It's housed in a robust aluminium chassis that encloses a lot of densely-packed electronics, cooled by a miniature fan that's quiet enough to go unnoticed for home use. The layout and components are top-class and the general build quality is first-rate. Front-panel controls are easy to understand - volume control for the clean channel, gain and volume for the overdrive, with a rotary switch to select the voicing. There's a trio of standard bass, mid and treble controls, plus global controls for master volume and reverb level. Below these, you'll see the Amp 1's three robust, illuminated footswitches. The switch on the left toggles between the clean channel and the preset overdrive sound, the centre switch activates a boost function that acts on clean and overdrive sounds, while the right-hand switch toggles the digital reverb. There's also a second operation mode that allows each of the switches to call up a preset using any clean or overdrive voice, with or without boost. The reverb is the only digital part of the signal path - the preamp is analogue solid-state, firing into a sub-miniature twin triode valve, which in turn drives the 100-watt class D output stage. On the Amp 1's left-hand side, there are trim pots to vary boost level, tone and volume for the classic and modern overdrive sounds, and the clean channel tone. A couple of miniature toggle switches change the effects loop mode from series to parallel, and vary the built-in noise gate, with hard, smooth and off settings. An array of sockets on the rear panel include a standard input jack, effects send and return, dual speaker outs and a speaker-compensated recording/line output, which can also drive headphones. A single footswitch jack covers the use of regular latching switches and MIDI controllers, automatically sensing when serial data is present. This is the first clue to the Amp 1's ethos: it can be simple to use, or as complex as any guitar player might need. Without any additional hardware, the Amp 1 easily covers most guitar players' needs, either in direct or preset mode; however, those who want more can buy the purpose-made Remote 1, which gives direct access to all of the Amp 1's functions, along with 36 patches in nine banks, as well as adding a power soak function and a second master volume for the Amp 1's output stage. There's also the Looperkit, which adds four relay-powered, true-bypass effects loops, the switching status of which can be saved as part of a preset. Without these accessories, there's still a huge range of tone and flexibility lurking behind the Amp 1's illuminated control panel. The clean, classic and modern channels each have a separate tone and volume trim pot that can make a huge difference to the way each channel responds. The clean channel goes from classic warm 'blackface' to modern sparkling hi-fi, and it can also be overdriven slightly by using the boost function, accessing many of the classic blues and pop tones of the golden age of guitar rock. "We've seen several pedalboard-type amps in the last couple of years, but the Amp 1 is in a completely different league"
The vintage overdrive voice is based on classic British overdrive sounds of the late 60s and early 70s. This purist voicing is Thomas' signature sound and doesn't have a custom tone control on the side, so its finely-tuned sound can't be lost. The classic and modern voicings can be altered significantly - the former going from woody Plexi-type punch to JCM800 grind, while the latter is more in tune with modern American high-gain amps, and perfect for ballad soloing as well as metal, particularly with the noise gate in metal mode. Blug is well-known for his unique modified '61 Strat, so you'd expect the Amp 1 to be flattering to single coils, but it works just as well with humbuckers, especially bright PAF-types. What really sets it apart, though, is the powerful and very dynamic punch of its unique valve-driven 100-watt power stage. Plugged into a good 4x12, it can handle any gig with power to spare, while being just as useful at home or in the studio plugged into headphones or a mixing desk. We've seen several floor-standing pedalboard-type amps in the last couple of years, but the Amp 1 is in a completely different league, combining great tone and useful features with the simplicity of a vintage head, while offering the option to add MIDI control and patch presets for players who want all of that. Without it, the Amp 1 is still a potent tool and one that could revolutionise many players' backline needs. It looks great, sounds great, it's portable and has plenty of features to keep die-hard tweakers happy for hours. It may seem a little on the expensive side, until you remember this isn't a stompbox but a fully functional four-channel 100-watt head - compared to the competition, we reckon it's excellent value for money and fully deserves our top accolade.